Wow! Really that was great to read. I’m impressed with the detailed walk thru and good explanations. Thanks! Now it’s not enough with the emulator and must look for that cartidge and fix it with one of the Joe Grand eprom adapters! Maybe it is like the tendency straighten a picture that is hanging crooked on the wall. And years later after leaning assembly this person is reminded by coincidence of this game. So, they go fix it. Fixing or improving on some ancient obsolete technology is at least cute. Hacking of this nature is a leisure time activity, hell the bulk of hacks featured here fall under leisure time activity. When it come to leisure time activity different strokes for different folks. Until it impacts other negatively why even bother mentioning it? better things to do… yes, like watching TV, playing a video game, or solving a puzzle? Seriously, do you know where you are asking this question? Exactly. I got that question asked a bunch when I messed around with hacking things or building circuits in highschool. “Oh you have too much time on your hands” or “don’t you have better things to do”. Oh, I’m sorry, would you rather I go smoke pot and play Call of Duty like half the other guys my age? Is that time better spent? Why is someone taking the time to complain about this project? Don’t they have better things to do? I agree that posting comments is fun but some comments, like this one, are better off forgotten. So I don’t understand how someone can comment like this for any reason other than the fun of hearing themselves talk. Why is someone taking the time to post a rebuttal to a complaint about this project? Don’t they have better things to do? I agree that posting rebuttals to comments is fun but some rebuttals to comments, like this one, are better off forgotten. So I don’t understand how someone can post a rebuttal to a comment like this for any reason other than the fun of hearing themselves talk. Who are you to decide what are the best things to do or not to do? You are not a hacker, you are a user. you dont understand the challenge of not only reverse engineering someone’s code but discovering and fixing the bugs and doing it the hard way by working with a disassembly. When you do this , you are finding a secret path into the mind of the man that wrote it. He got inside the programmers brain in that moment of time when it was written. And then bested that programmer by fixing the bugs and improving it. keep in mind the original programmer may have been under time pressures and would have liked to do a better job. Like making cotton candy at an art fair. Yup. Howard is a good friend of mine and an exceptional engineer. 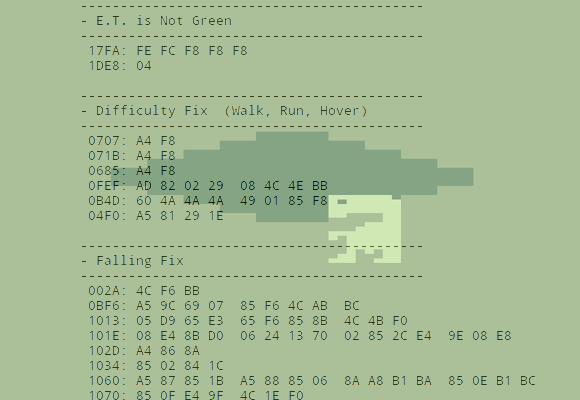 Like most bad or flawed games, ET was a function of mismanagement by higher-ups, not lack of talent on the part of the people doing the work. This is more true than ever now, as games projects have become huge endeavors. ET isn’t even the worst game for the 2600, let alone all time. The timing of the launch with the ’83 video game crash and resulting landfill give it a worse rep. than it deserved on a pure game play level. Not that it was great, but I had a copy in grade school and it was playable, if overly difficult due to the pitfall/levitation mechanic. Because if you read his article he said that although almost universally reviled it was one of HIS favourite games as a child, so what better project to show hackerly legerdemain and walk fondly down memory lane than this? But on the other hand since one of the problems he fixed was the alien ship CRUSHING Elliot how could have the game really been? There’s nothing wrong with fixing something like this. They obviously would have meant to do so back than anyway. Plus, it’s a great excuse to work with the code and allow others to learn from it as well. The best modern programmers are the ones that take the time to learn how the legacy CPUs and graphics hardware work. This is a neat way to do that. As for the game itself, it’s apparently not a bad game once the bugs are ironed out of it. That and you’ll never see another game like it again. TO be honest there’s almost nothing in common with the Atari 2600 and modern systems. But the 2600 is fascinating in it’s own right, and certainly a challenge. It only has 128 bytes of RAM! In a 6532 RAM / I/O / timer chip (RIOT). The video is generated one scanline at a time, microseconds before it’s spat onto the screen, the CPU sends bits to the registers for 20 background pixels, 2 8-pixel wide sprites, 2 “missile” bits and a ball bit. So a good 80% of the time is spent spitting pixels at the screen, with a bit of logic done in the horizontal borders, the rest in the vertical ones. So cycle-counting is necessary, all the time! Probably it’s a good tutorial for people working with microcontrollers and other small systems. Same RAM limitations, limited instruction set, and often same need for realtime cycle-accuracy. Modern PC and consoles are programmed much more high-level, all object-oriented, and the programmer doesn’t do most of the mid-level polygon plotting, never mind sending out the actual pixels! I suppose they could use 2600 coding to replace IQ tests. And diagnosing mental illness, if not actually causing it! Oh no! How dare someone use their own time to do something you don’t approve of! If only they consulted you first! That way they could have use it more constructively like hanging around HaD complaining that people use their time to actually do things! (yes i am aware of the irony). I should add that this was to prevent track 0 slamming from taking the drive out of alignment… protection used to be hard on hardware! At least on the classic 1541. I still remember the rattling sound when you formatted a disk. I think the 1541-II had a switch or detector for that, but I did never owned one. another trick i found you can do is kill et and send him home at the same time. then run his life meter down to 1 (if i remember correctly you start off with 10000 or 9999 on the life meter) then while waiting for the spaceship there is another timer that shows when the spaceship will come. if you can get the life meter to 1 and the last segment of the spaceship timer you can send the life meter to 0 just as the spaceship timer hits 0 and et will be killed and still go home. The hack is interesting, but I hate digging trough Reddit posts. The ’90s band Wintergreen made a video about this game for the song “When I Wake Up”. It’s on youtube, but the best copy is on the director’s website http://www.keithschofield.com/. It’s pretty geeky. You’re lucky it’s not Realplayer. Conveniently timed, we’ve launched a Kickstarter project around E.T. for Atari 2600, exploring a re-imagined version of the art. Check it out, and back us if you like what you see. We’re halfway to our goal after just a couple of days. Is the guy who wrote this game still alive? Would be interesting to get his take on the bug fixes etc. Yup, Howard is still around. His Atari days were a very long ago though, so most stories like this are mildly amusing to him, but it’s ancient history. ET is in the news a lot because of its infamy, but he doesn’t pay much heed. Less attention is shown to his game Yar’s Revenge, generally considered among the very best on the platform. Raiders of the Lost Ark is also generally well regarded and is another of his. He made an excellent documentary about those days called Once Upon Atari. I recommend it if you’re interested in the environment that these games were made in. It’s an interesting story and it’s been told a few times. Howard Scott Warshaw had something like a month to produce the game, from scratch, after Atari got the license just before Xmas. It was the best he could do, and knowing 2600 programming a little bit, it’s an achievement. Thing is, even with a few fixes, it’s a goddam boring game. It’s broken all the way through. There’s no TIA address for fun. It was right at 5 months – we tell the story on our Kickstarter page (posted above) but yeah, they had very little time to deliver a finished product. The game is horrendous. Funny how things didn’t change much over the next couple of decades, with regards to overly-rushed video games from licensed properties such as film. Maybe not movies, but some games based on TV shows deserve positive mention. The NES game Duck Tales was pretty decent and Chip ‘n’ Dale’s Rescue Rangers was better, being one of the better two-player-simultaneous options for the platform. Little Nemo was an awesome (challenging) game. You may want to check your Kickstarter, because any places I’m seeing say 5 WEEKS, not months. You’re right. I don’t recall where I saw the 5 months number but just checked a number of sources and it appears to be 5-6 weeks. Will change ASAP – thanks!! From his description it sounds truly awful indeed. You can have as many good features as you like but a single bad feature can ruin a game. ET is the game that famously has 4 million copies bulldozed into the desert in New Mexico somewhere. Atari fans have spoken of organising expeditions to dig them up. This hack rocks infinitely more than the usual Arduino “me too” projects. Fantastic job on the fixes and excellent documentation! It was decently challenging but easy enough you could figure it out. Unlike some games I have played over the years…. Fantastic. Now, can somebody fix “Friday The 13th” for the NES?